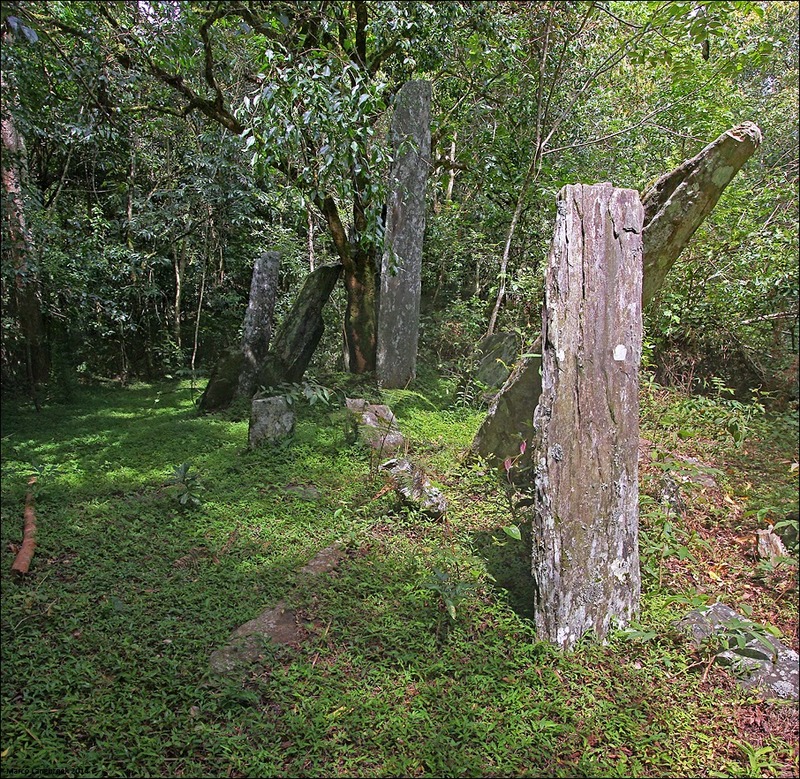 These megalithic sites are located in the mountains about 35 km southwest of the sleepy provincial capital of Sam Neua. The two most important sites are San Khong Phan and Keohintang. Both sites feature over 100 standing stones arranged in small linear grouplets. The largest of these standing stones, made of long narrow slabs of schist, are 2.5 to 3.4 meters tall, but many are much smaller. Scattered between the standing stones are large flat-lying round slabs of stone. These are cover stones of burial cysts dug into the bedrock. How old these standing stones exactly are is still largely a guess. 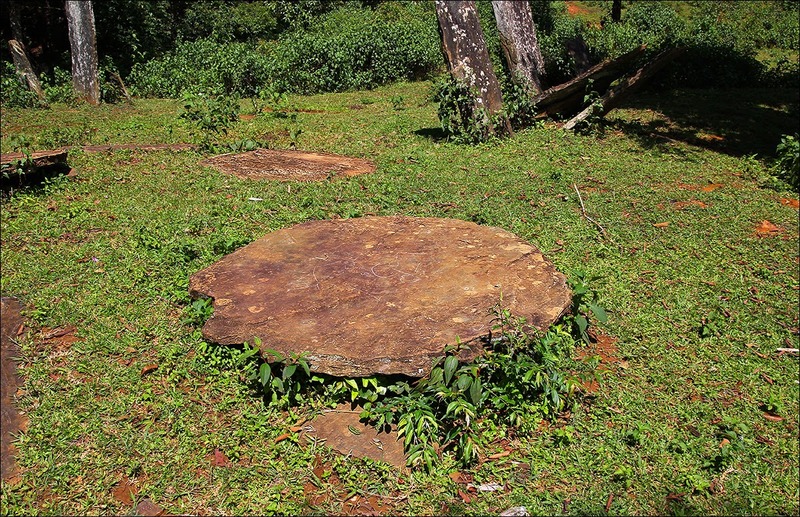 Based on the pottery and bronze artefacts found at the sites, they are probably at least 2000 years old, if not older, and similar in age or even somewhat older than the famous jar sites on the Plain of Jars. 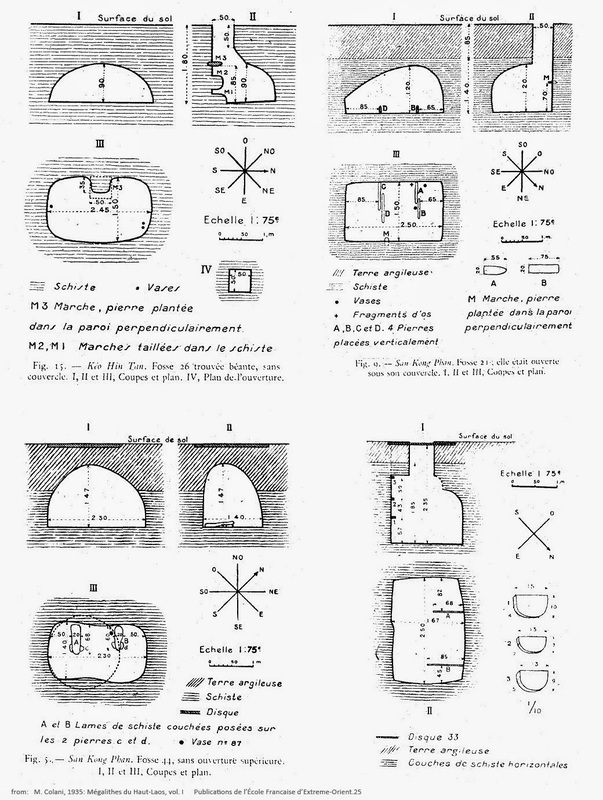 Their meaning is likewise a matter of conjecture, although the presence of burial cysts amidst the megaliths suggests a connection to burial ritual. To my knowledge, no excavations have been conducted here since Madeleine Colani's excavations in 1933. San Khong Phan (above) is the most accessible and hence most visited of these megalithic sites, as it is right next to a dirt-road branching off Route 6. It is one of the larger, impressive sites. 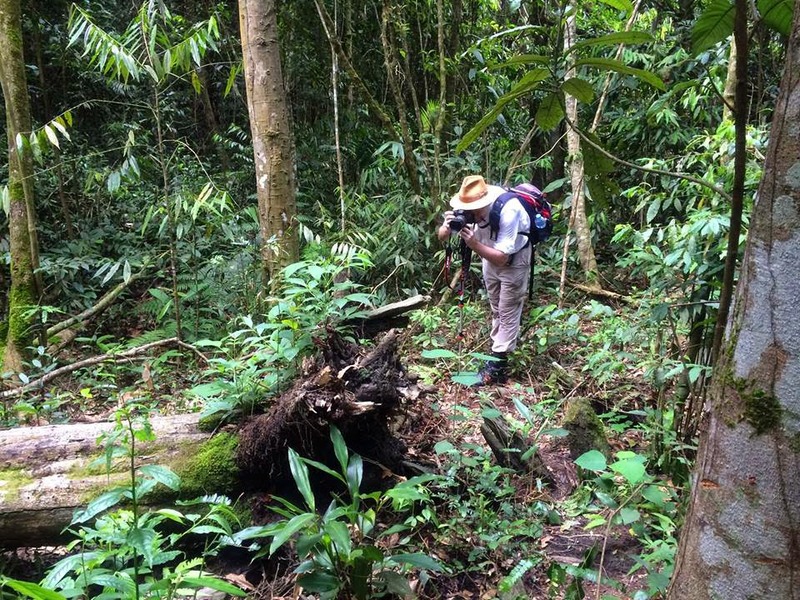 Another large site, Keohintang (below), is less often visited and can only be reached by foot, over a jungle trail. It is located on a beautiful tranquil half-open spot in the forest. 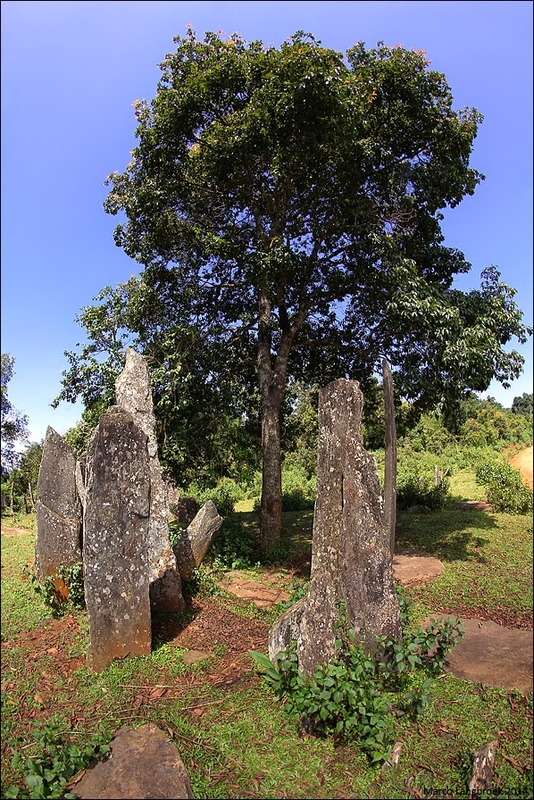 Keohintang actually is the largest of all the sites and features the tallest standing stone of all, an impressive slab of schist measuring 3.4 meters high. 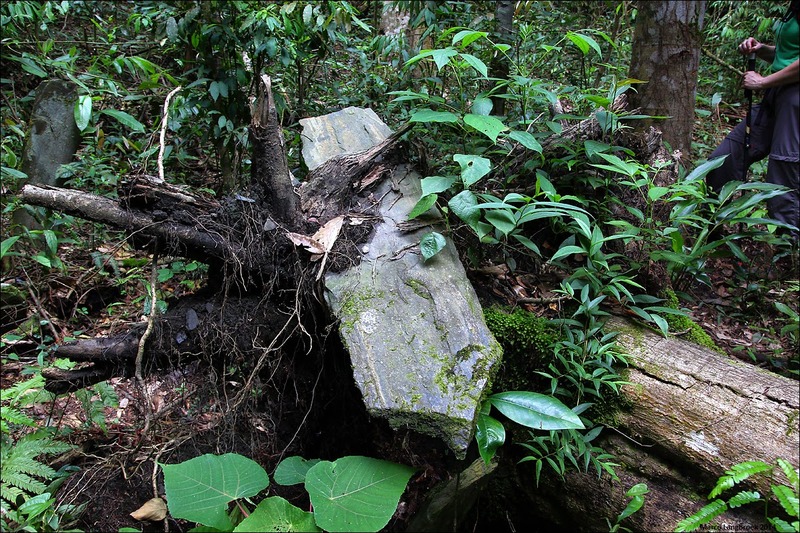 I have seen on-line travel diaries that suggest to only visit San Khong Phan, claiming it is not worth to walk the Hintang forest trail to the other sites. I disagree and suspect most of these travel writers actually never walked the trail. The two hour hike along the forest trail to Ban Tao Hin village brings you along the large impressive Keohintang site and along several other, (much) smaller sites in the forest. It is absolutely worthwhile, and the trail itself is actually quite easy to walk. Walking the Hintang jungle trail adds an element of mystery and adventure that you'll miss out on when you only visit San Khong Phan. 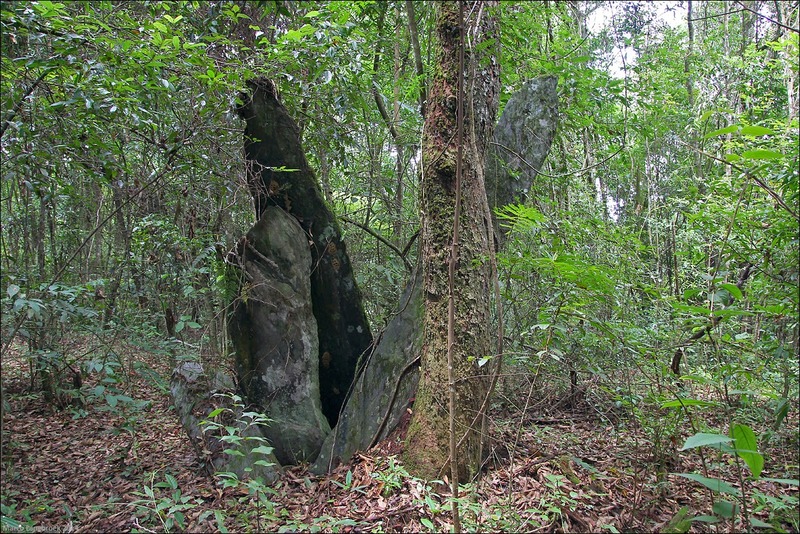 With the mesmerizing sound of cicada's filling the air you walk a small footpath through the tropical forest, occasionally scaling a fallen tree, encountering standing stones emerging from the dark forest every 10 to 20 minutes. It truely gives you a sense of exploring and discovering. While preparing for our visit in the summer of 2014, I could find frustratingly little information on these sites on the internet (or indeed, in the literature). I found no useful maps and very little GPS data. On-line descriptions on how to reach the sites are sometimes confusing and mostly cover San Khong Phan only, and not the Hintang jungle trail. In this post, which describes our July 2014 visit to the sites, I will provide a map (below) and GPS tracks and coordinates. I will also provide brief descriptions on how to reach the sites and descriptions, photographs and video of the sites themselves. Map created by the author based on his own GPS measurements. The standing stone sites, known as Hintang, are distributed along the crest of a prominent NW-SE running mountain ridge (see map above and 3D models below) near the villages of Ban Phao and Ban Tao Hin. The sites, strewn along a line several kilometers long, are located at elevations between 1400 and 1500 meter above sea level. With the exception of San Khong Phan, most of them are located in thick forest. This makes many of them easy to miss. The map above shows those sites which we encountered during our hike (descriptions and GPS coordinates will be given below): there are however many more, hidden in the forest. 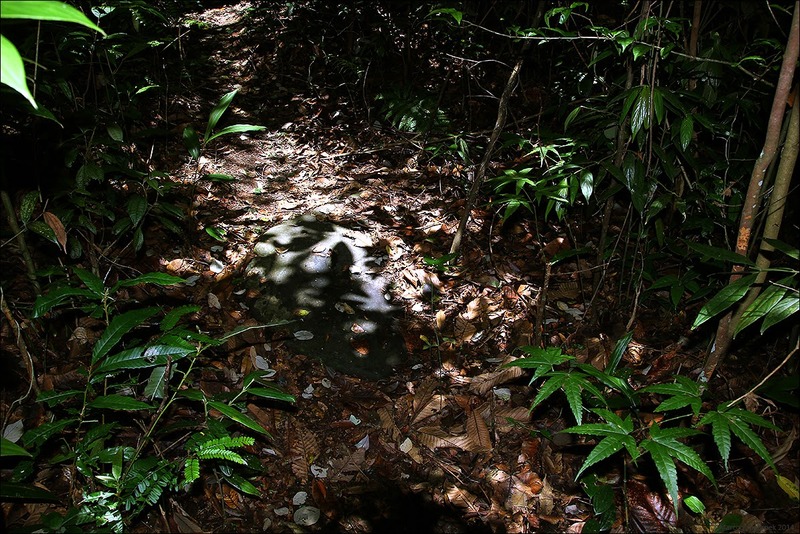 It is very easy to walk by a site without noting it (and we probably did on occasion), as it can be dark under the tree cover and the undergrowth at places is quite thick. Mossy growth on the stones and their narrow tall profile means they are easily mistaken for tree trunks. The Hintang forest trail covers only a part of the known site distribution. 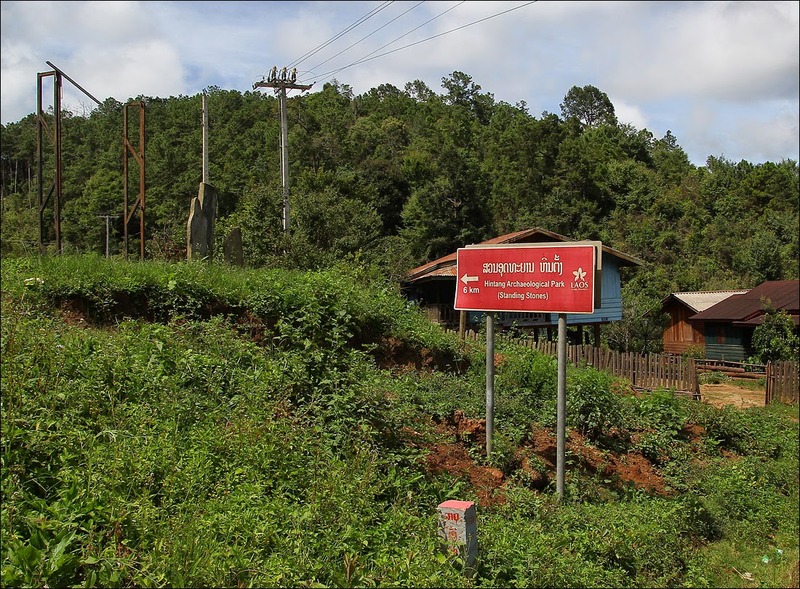 Many more sites (not visited by us) are known to be located further along the ridge to the SE of San Khong Phan, as well as on the extension of the ridge to the NW of where the trail bends off and ascends the ridge to Ban Tao Hin village. The best place to start your visit of the Hintang Archaeological Park is from the province capitol of Sam Neua, 35 km from the sites. 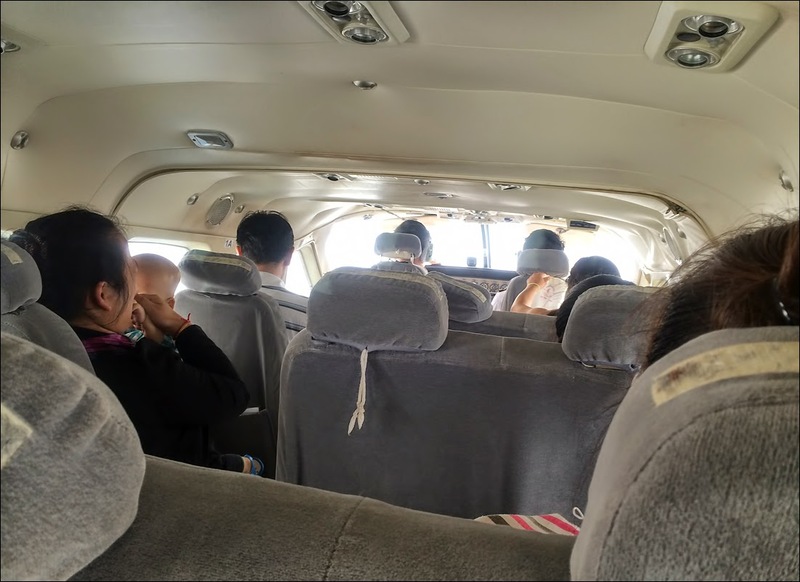 Sam Neua can be reached by a two-day bus ride from the Laotian capitol of Vientiane, or by a 1.5 hour flight with a small aircraft from Vientiane Domestic Airport (which is right next to Vientiane International Airport). In our case, we took the aircraft. 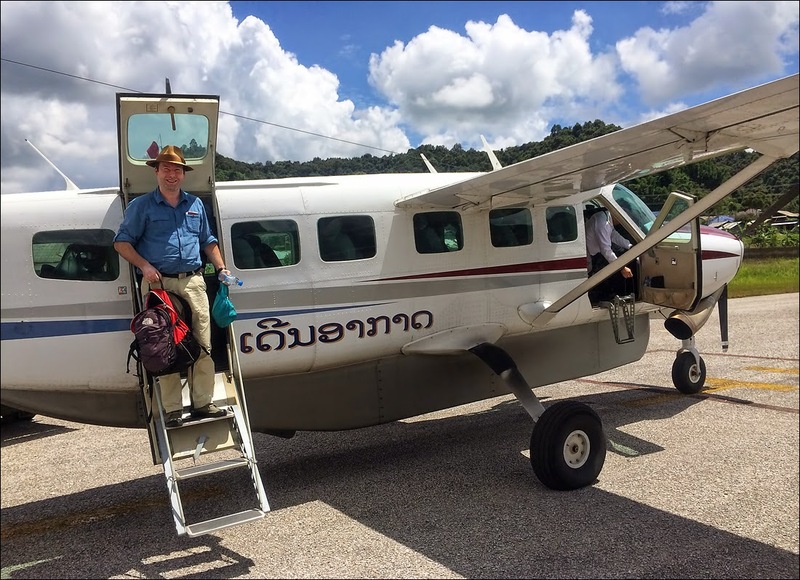 This route is flown by a company that unfortunately changes name every few years: when we were there in the summer of 2014 the name was Lao Skyway. Booking (or contacting the company) over the internet previous to our visit appeared not possible (we simply did not get an answer). After arriving at Vientiane airport from Bangkok, we therefore went to the departure hall of the domestic airport (which is at your left when you exit the international airport), where the company has a small office hidden in the back. We managed to book a flight for the next day. 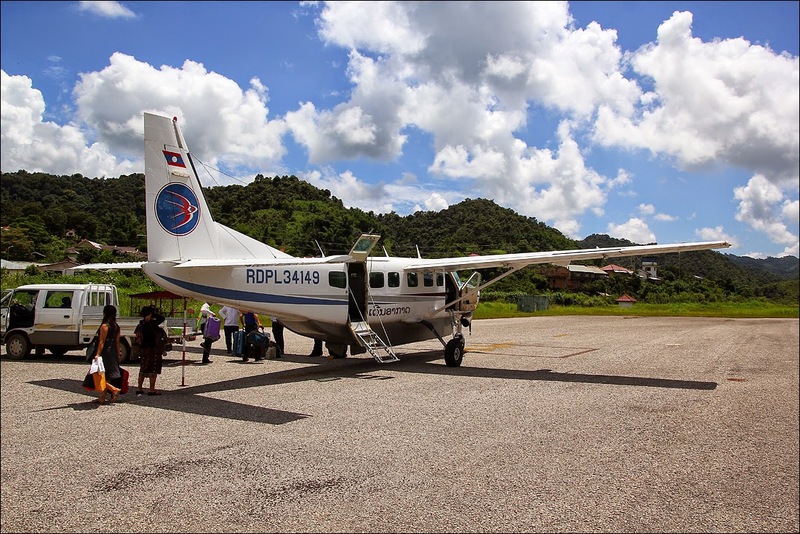 After 1.5 hours spent suspended between white clouds and green rice paddies, we landed on the small and simple airstrip of Nathong, just a few kilometers east of Sam Neua. A man in a suit approached us, surprised but enthusiastic to see tourists arrive with the aircraft. He turned out to be the Vice-Governor of the province. Someone from the small airport office called a taxi for us. 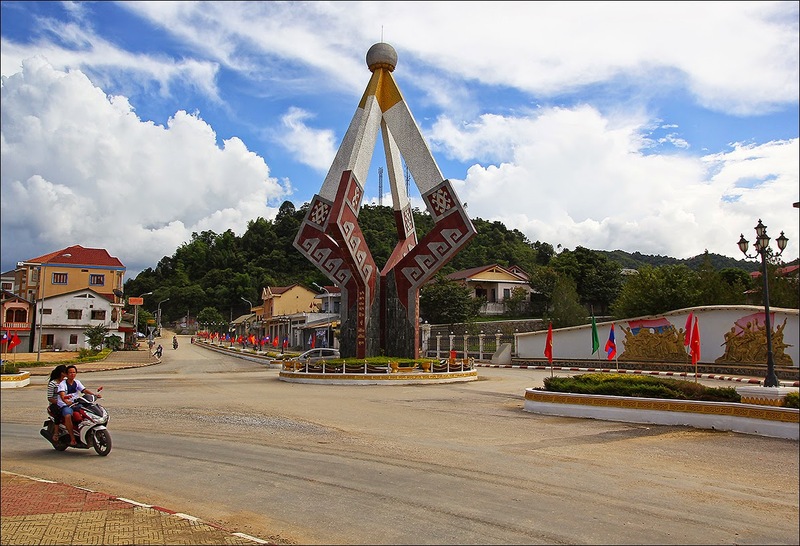 Sam Neua presents itself as the "Birthplace of the Lao PDR". During the Laos Civil War, Sam Neua was in the heart of Pathet Lao territory and an important strategic target. Not far from Sam Neua are the caves of Vieng Xay, where the Pathet Lao went underground to escape the incessant US and Royal Lao bombing. The area saw fierce fights between the Pathet Lao plus their North Vietnamese overlords on one side, and on the other side the CIA trained and equiped Hmong guerilla army of general Vang Pao, plus the Royal Lao Army and Thai troops. There are a number of guesthouses in Sam Neua, which is a very small, sleepy town. We stayed in the KhemXam Guesthouse. We had a good spaceous room (make sure to take one of the two expensive ones, as the cheaper ones did not look good), with a large, good bed, a bathroom and a balcony overlooking the river. Most people here (including guest house staff) have at best a limited and often no mastery of English. There is one restaurant in town (Dan Nao Muang Xam, just around the corner from our guesthouse) with staff that speaks English and which has an English menu. In the evening, this small eating place is the meeting place for the handful of tourists and expats in town. The food is decent here. This is a good place to have breakfast too: it opens at 7 am. The owners can also help you arrange a tuktuk or taxi to the airport or to the bus station. There is a Tourist Office in town with a very friendly, English speaking staff. It is not where the maps they provide you in the guesthouses (or in our guesthouse at least) and in the Lonely Planet locates it: it has been moved further down the road. While friendly and of good intent, the office staff does not really seem up to the task. The trip to the Hintang Archaeological Park which we initially tried to organize through the office largely fell through (see end of this post). The staff appears eager to learn from its mistakes though. Sam Neua is not a very vibrant place. One of the few sights of note to visit in Sam Neua (apart from the odd and ugly Suan Keo Lak Meung monument) is the food market, at the other side of the river. It is your typical Laotian market with amongst others (live) frogs, fish, fruit, meat and all kinds of other food. Close to it is a regular market with some handicrafts, snacks, drinks etcetera. Apart from the Hintang Archaeological Park, Sam Neua is a well suited homebase for trips to the Vieng Xay caves that served as the Pathet Lao hideout during the Secret War. Other tourist spots in the area suitable for a daytrip include a waterfall and hot springs. Sam Neua was your homebase for our Hintang trip. Starting in the early morning, visiting San Khong Phan, walking the Hintang trail to Keohintang and Ban Tao Hin and next travelling back to Sam Neua was done as one (long) daytrip. 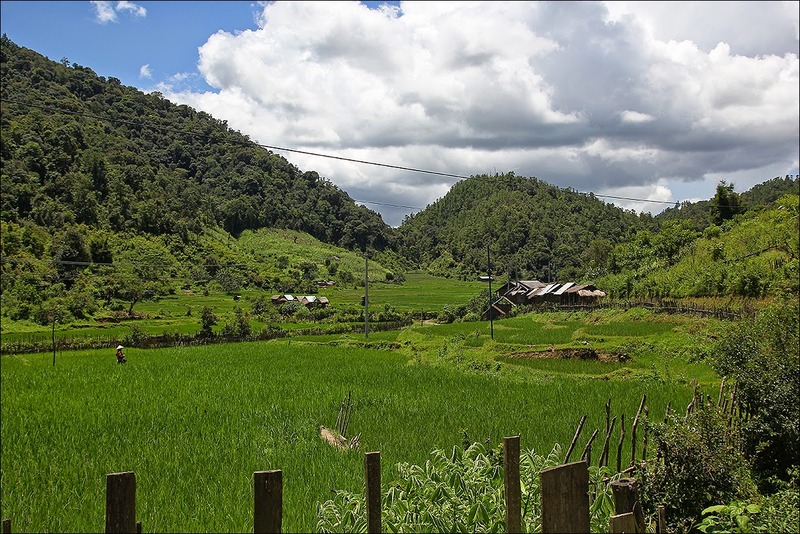 Sam Neua is located some 35 km to the northeast of the sites. Instead of hiring a car, taxi, tuktuk or motorcycle, I advise you to take a public bus: several of them leave between 7:30 and 8 am from the bus station of Sam Neua, which is located about one kilometer out of the town center. Be there early, as you have to buy a ticket first. Busses leave as soon as there are enough passengers, which can be both early or late. As most busses do not by definition stop in small villages, make clear to the driver that you want to get out at Ban Phao village. Keep an eye open for the village after about 2 hours driving, in case your driver has forgotten that you want to get out there. 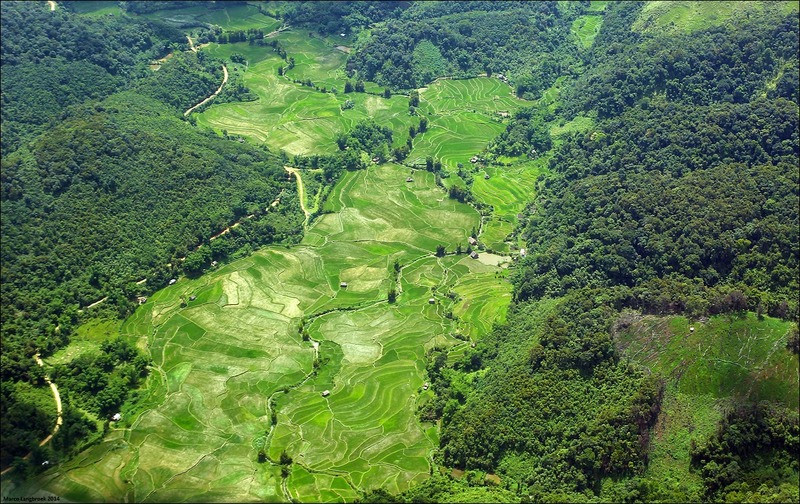 From Sam Neua you first travel by bus along Route 6, a scenic drive along a winding two-lane mountain road with many hairpin bends, alternating forested mountain ridges and wide vista's over the mountainscape with passages through small green valleys occupied by small villages and rice paddies. 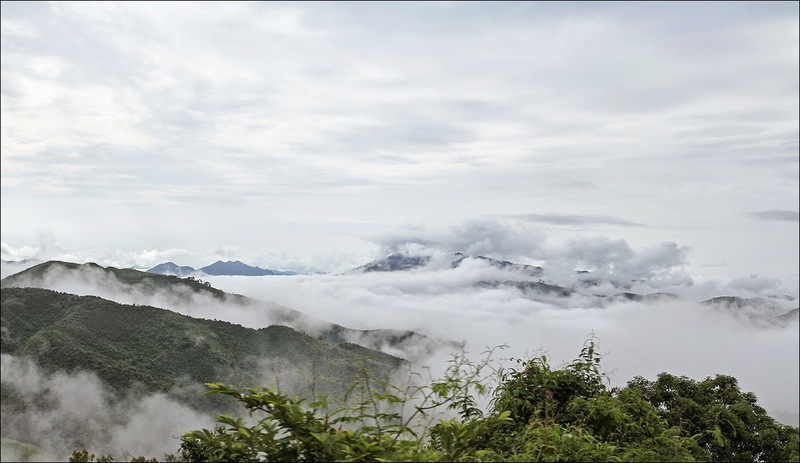 Early on in the trip, as you cross over the mountain ridges south of Sam Neua, you have a chance to see the "sea of clouds", a blanket of clouds filling the valleys below you, with the mountain tops sticking out above it. Livestock and people lumber about at the edge of the road, and sometimes lie down in the middle of it. Be not surprised if the bus-driver stops along the road to buy some food, or because (as happened to us) the brakes are overheating and need to be cooled down and cleaned with some water. It takes some two to two-and-a-half hours driving to reach the small village of Ban Phao (located at 20o.1589 N, 103o.8913 E), where a dirt-road branches off route 6 towards the south. 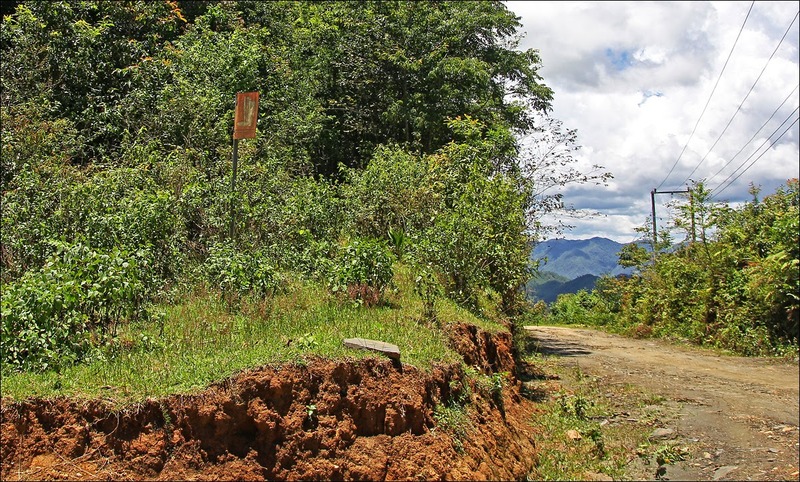 This dirt-road leads to the big San Khong Phan site and the start of the Hintang forest trail. Just before reaching this point, while still on Route 6, you will pass a large red sign with white lettering saying "Hintang Archaeological Park" at the right-hand side of the road. About 1.5 minutes and a few bends in the road later, you enter the start of the village, just before the road crosses a small bridge. The start of the dirt-road is at the left-hand side of the road and marked by a small knoll with three miniature standing stones and a small red sign "Hintang Archaeological Park (Standing Stones)". This is the place where you have to get off the bus. 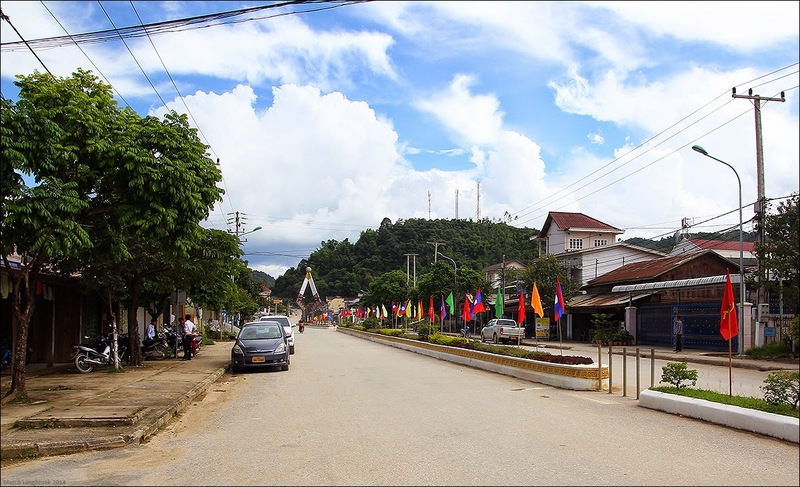 From the start of the dirt-road where it splits off from Route 6 at Ban Phao (located at 20o.1589 N, 103o.8913 E), it is a 5.5 kilometer (3.4 mile) walk over the dirt-road to reach San Khong Phan, the Hintang 'main site'. Over these 5.5 kilometers, you will climb about 350 meters (1150 feet) in altitude, from 1200 to 1550 meters above sea-level. The walk will take you about 1.5 hours. However, if you are lucky you might get a motorbike lift from a passer by (as we did for the last two km). I found this dirt-road to be the most challenging part of the hike. There is very little shadow on the road and not much wind, and it gets very, very warm in the sun. Take a lot of water with you, 2 liters per person at least. The road is almost continuously ascending (see elevation profile above), with slope percentages sometimes reaching 20-30%. The views along the road are frankly not that exciting. Along the way, about 2 km before you reach San Khong Phan, you will pass the start of the Hintang forest trail, on your right-hand side. 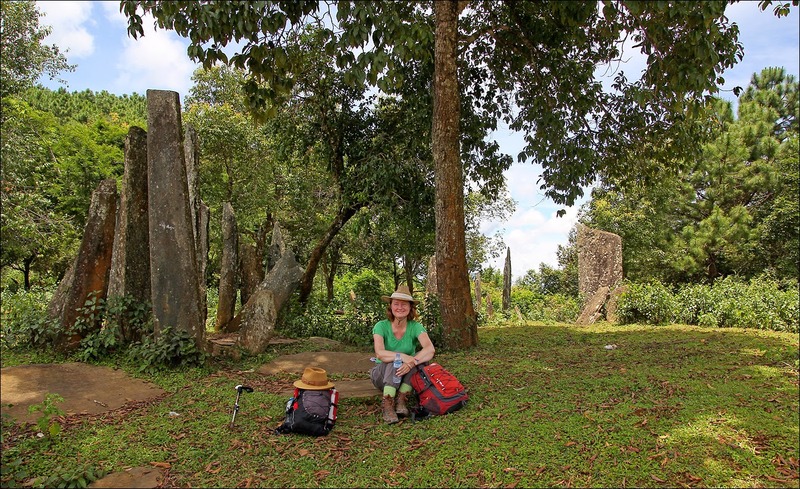 I however advise you to first continue along the dirtroad to San Khong Phan, spend some time there and maybe have a romantic picknick amidst the stones, and then walk back to the start of the trail. The San Khong Phan or 'main' site is right next to the dirt-road and the most well known and easily accessible of the Hintang sites. Approaching it over the dirt-road branching off from Route 6 at Ban Phao village, you will see it on a half-open spot amidst the trees on the right side of the dirt-road, after crossing over a prominent ridge-crest a few hundred meters back. 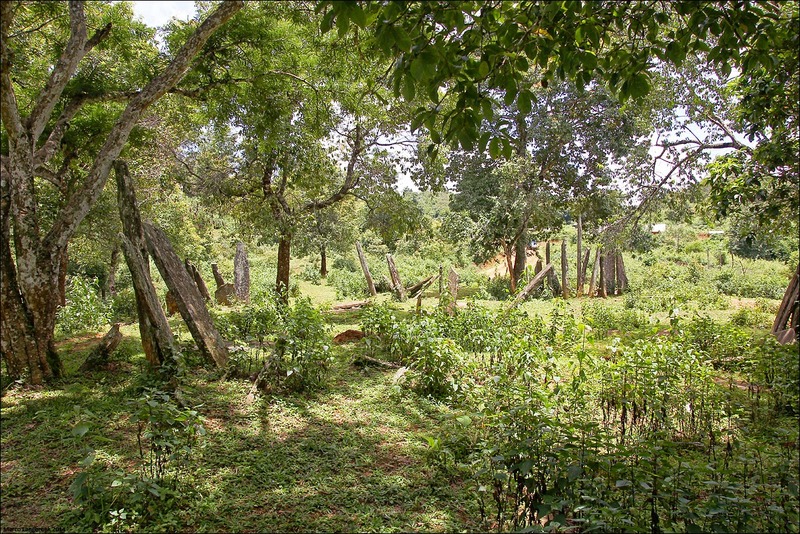 The site consists of over 100 standing stones, distributed over an area of about 60 by 35 meters. Most of the stones are part of small subgroups that form discrete semi-lines of which the majority appear to be oriented perpendicular to the mountain ridge, with a smaller number parallel to the ridge at a 90 degree angle to the others (this arrangement is generally true of the other sites as well). 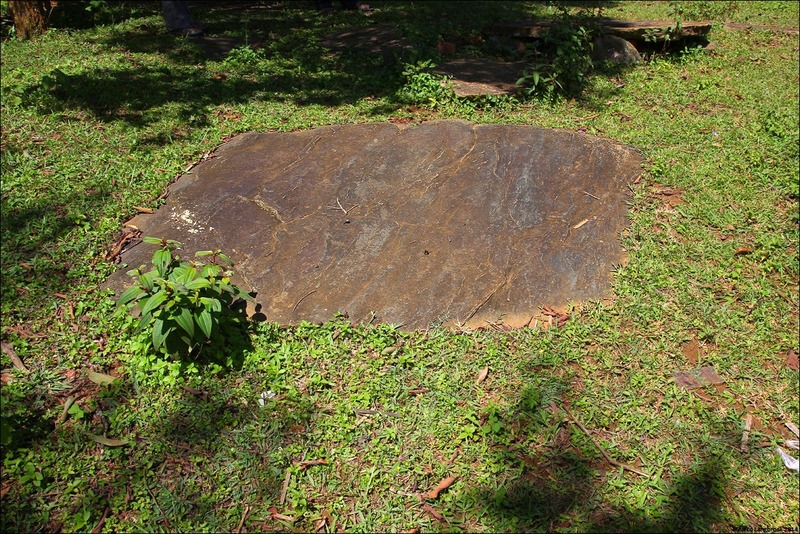 The stones are made of a metamorphic rock called Schist, the same stone type as the local bedrock hidden under the red muddy laterite soil. 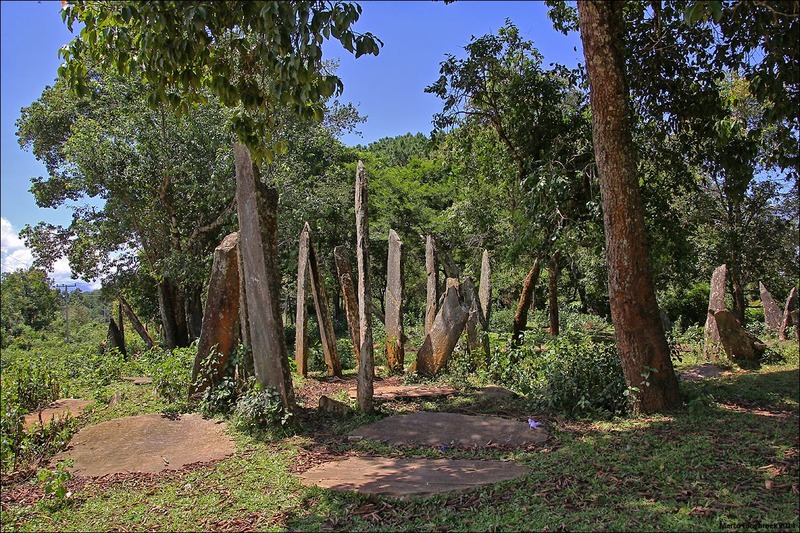 Many of the standing stones are broken, leaning, or have toppled over. Yet quite a number are still standing. The largest ones are about 2.5 meters tall. These large ones are usually located in the middle of the line-ups. Scattered between the lines of standing stones are flat-lying large semi-circular stones embedded in the soil. These are stones capping the entrances to underground caverns dug into the bedrock, believed to be burial cysts. Like the standing stones they are made of local Schist. Walking back for two kilometers along the dirt-road in the direction from which you came, you will reach the start of the Hintang forest trail. You already passed it on your way up. 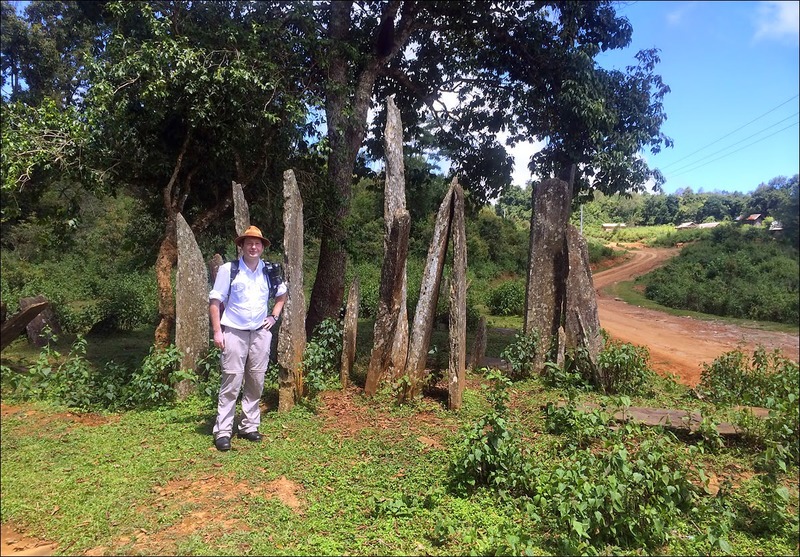 Coming from the San Khong Phan site, it is at your left hand side at 20.13369 N, 103.88275 E, recognizable by a large dilapidated roofed blue signboard and a smaller orange sign with white standing stones on it in the vegetation on the road embankment. A side-road splits off from the dirt-road here. This side-road is NOT the Hintang trail (it is merely a dirt-road leading to a nearby village). The trail starts on the embankment, where the smaller orange sign is. Look for a narrow footpath on the raised road embankment, disappearing into the foliage. Initially it runs somewhat parallel to the dirt-road, but then bends off to your left, and you start to climb a short steep slope. After you have climbed the short steep slope, the path becomes more or less level and actually very easy to walk. It is also much more pleasant to walk than the dirt-road because the tree canopy protects you from the sun. Less pleasant are the insects swarming around you: apply copious DEET deterrent before starting the trail hike! Also, be advised that there are leeches on the trail, notably after rain (one of us was bitten). 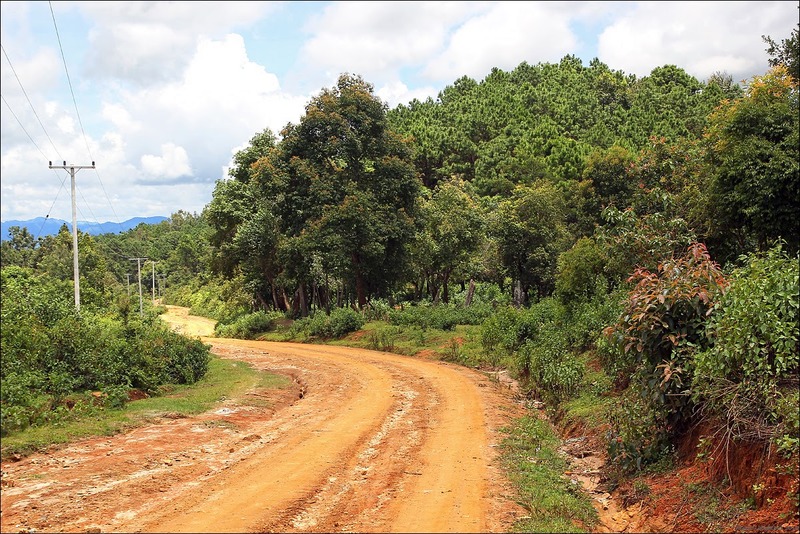 The total length of the trail from where it starts at the dirt-road to where it connects to Route 6 at Ban Tao Hin village, is 4.4 km (2.75 mile). Add to that the 2 km you already walked from San Khong Phan to the trail start, and the 5.5 km you walked coming up the dirt-road from Ban Phao: a 12 km (7.5 mile) walk in total. The Hintang trail starts at an elevation of 1495 meter and follows the crest of the mountain ridge. It slowly descends until (about two thirds along the trail length) it veers off the ridge crest and steeply descends the slope to Ban Tao Hin at 1305 meter elevation. The trail is narrow but well-recognizable: it is very unlikely that you will get lost (but take a compass with you, just in case). Our walking time, including time spent at Keohintang and other sites along the trail, was two hours. 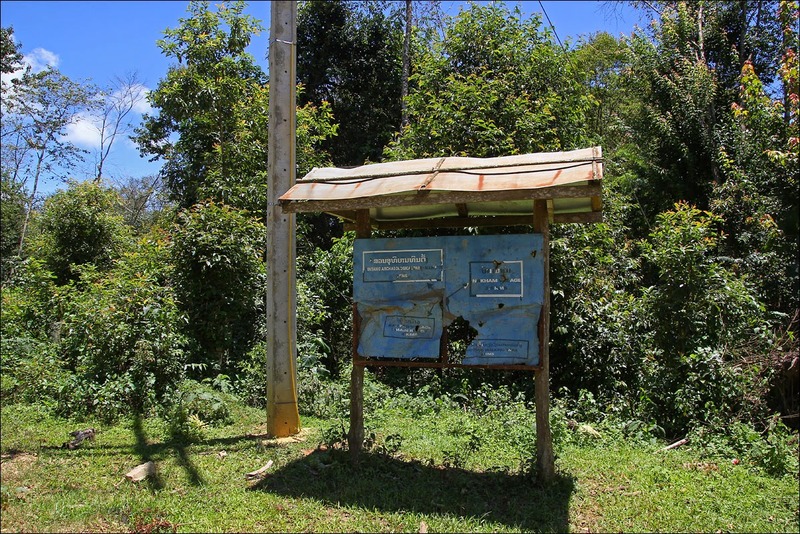 The area should be free of UXO (Unexploded Ordnance): nevertheless, as everywhere in Laos it is probably wise not to stray too far from the actual path. 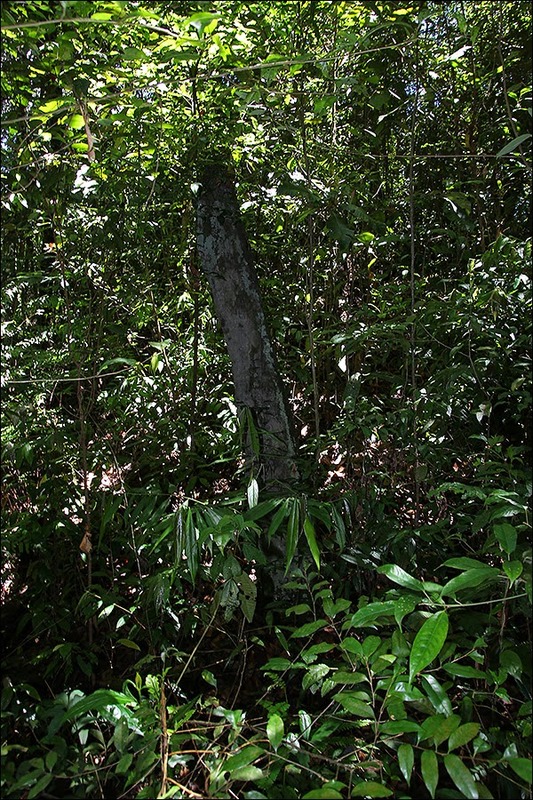 The forest varies between very dense and dark with a lot of undergrowth, and more open forest. As you are actually walking along the narrow crest of a ridge, you will frequently see light shimmer through the trees at one side of the path (usually the left side), and sometimes a slope on the other side. Every now and then, you will have to scale over a fallen tree. Cicada's make a deafening noise. 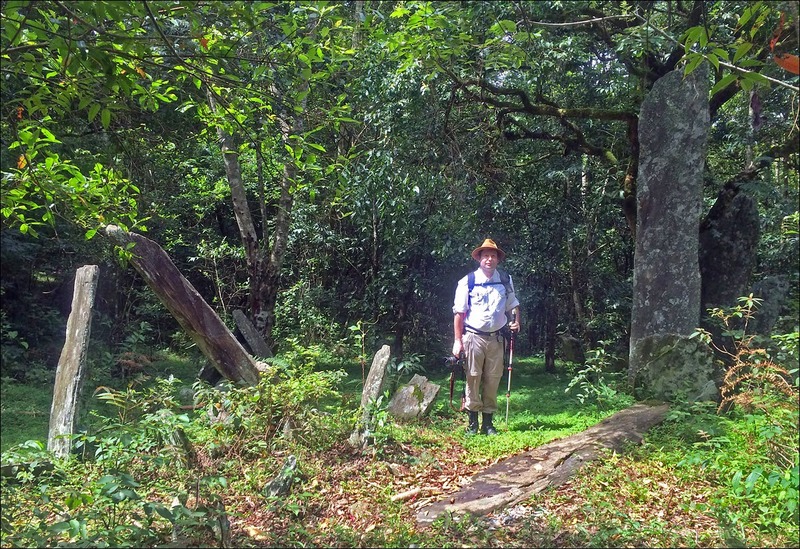 Shortly after the start of the trail, you will encounter the first standing stones. We encountered the following standing stone sites during our trail hike (letters refer to the letters on the map above, which is a site designation of my own private making: named sites are names from Colani, 1935). Be advised that we might have missed some. It is very easy to walk by a site without noting it (and we probably did on occasion), as it can be dark under the tree cover and the undergrowth at places is quite thick. 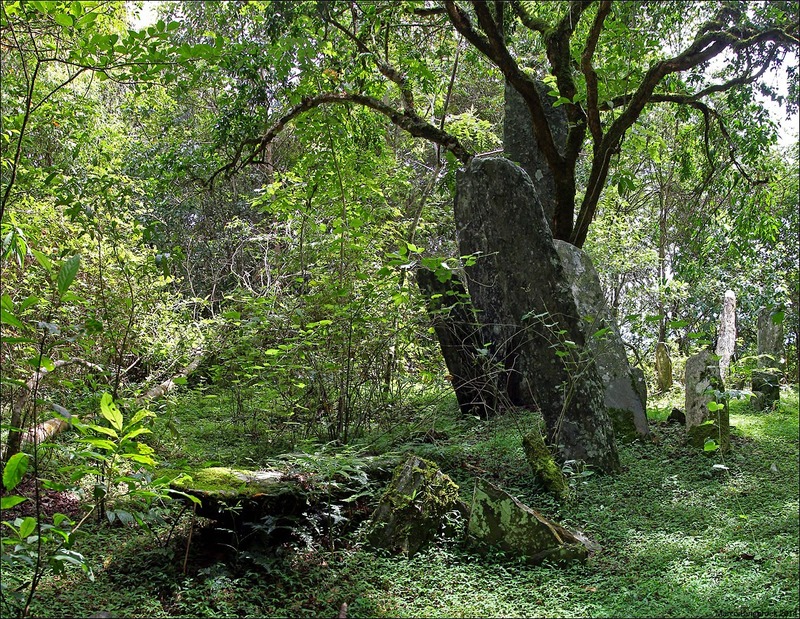 Mossy growth on the stones and their narrow tall profile means they are easily mistaken for trees. This is a not very impressive site only 125 meter after the start of the trail, just as you have scaled the slope. It is easy to miss. It consists of a flat lying (toppled) standing stone on the left side of the path. 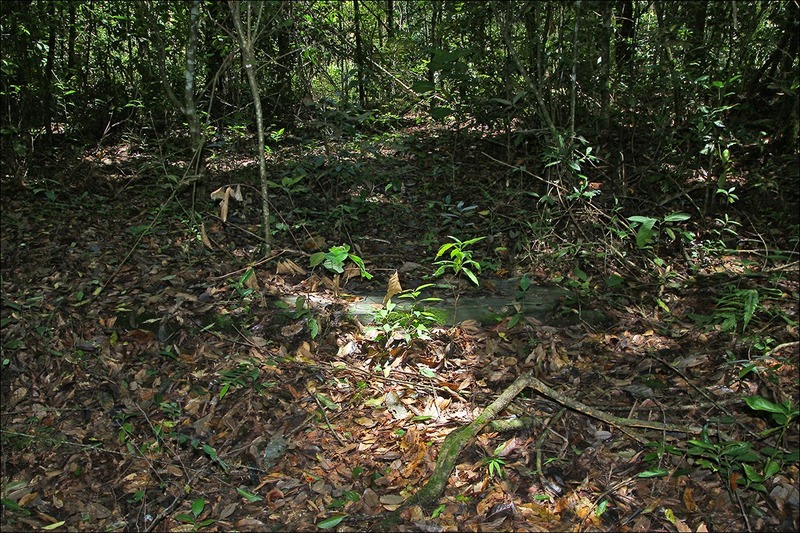 There is also the entrance opening of a burial cyst, without cover stone, slightly further down the slope on your left. About 100 meter after the previous site, you encounter a more impressive small group of four large standing stones next to the path, on your right. About one kilometer distant from the previous site. Two round burial cyst cover stones (one of them on the path) plus an uncovered burial cyst entrance are the first signs, and then you will encounter several standing stones on your right. After 20 meter, the stumps of yet more stones plus a toppled one at your right. I suspect that this is the site designated "Dong Mut" by Colani (1935), in which case there should be more standing stones hidden in the foliage on both sides of the path. In a rather dark stretch of forest 50 meters from site e. Multiple small standing stones crossing the path on both sides: a recently uprooted tree has broken some of them. Some 0.3 km after the previous site. First some barely visible stumps of standing stones, followed after 10 meters by a group of standing stones left of the path. This is 40 meters before you reach the very large Keohintang site, and in fact can be seen as the first standing stone grouplet making up the site. A very large and impressive site, featuring a large number (100+) of standing stones, some huge, covering an approximately 80 meter area. The core of the site with a couple of very large stones is located on a small open spot in the forest next to the trail on your right, creating a scenic tranquil atmosphere. 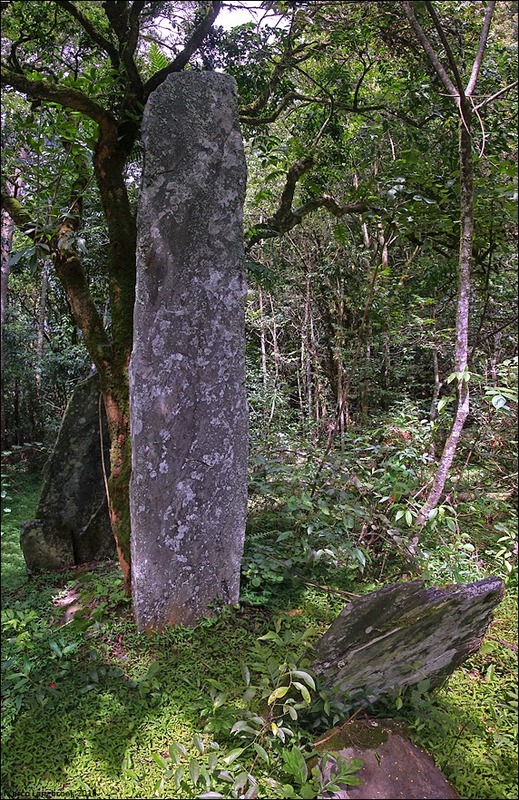 The biggest standing stone, close to a tree, is 3.5 meters tall. Another large but toppled one (at least as large or possibly larger as the one still standing) is lying flat in front of it. This site is at least as impressive as San Khong Phan and its hidden nature adds something extra. Just short of 1 km from Keohintang, this site was the last site we encountered on the trail, just before the latter leaves the ridge crest and starts to descend the slope of the ridge towards Ban Tao Hin village. 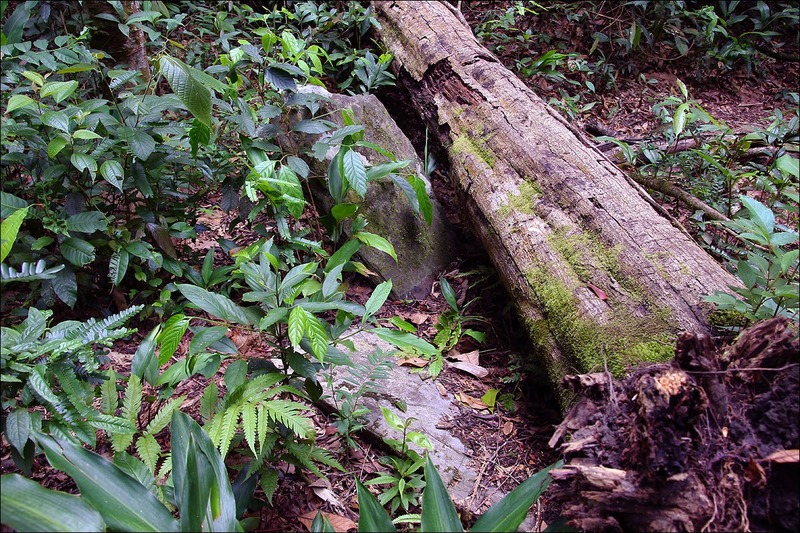 On the right side of the path is a half-toppled stone plus several fragments of others. Shortly after site k, the trail leaves the ridge for a steep descend towards Ban Tao Hin village. This part of the trail is muddy, steep and can be slippery. It offers a few vista's over the valley towards remote ridges. The trail ends in Ban Tao Hin village on route 6. Flag down a (mini-) bus to Sam Neua here. They are probably full, so be prepared for an uncomfortable two-hour ride back. I did it propped up between 4 Lao men, sitting halfway between two chairs. The metal rims of the chairs weren't nice to my bum and the road is very bumpy...the Laotians found every groan I made hilarious (and frankly, it was). Rather than hiring a car, I strongly advise you to travel by public bus from Sam Neua to Ban Phao and the Hintang sites. Travelling by public bus not only is a great travel experience, it gives you the freedom to explore the sites the way you want. We initially had arranged a car with driver to bring us to the sites through the Sam Neua Tourist Office, but that turned out to be a big mistake. Through a combination of misunderstandings, language barriers, and perhaps over-concern for our welfare by the driver and Tourist Office employee, we ended up only visiting the San Khong Phan site and were not able to walk the Hintang trail that day. The man from the small tour agency connected to the tourist office did not seem to understand why we would want to see the other sites if we already had seen San Khong Phan. He also seemed to be concerned that we would get lost, which was nonsense. The trail is very clear and it is really not likely that you will get lost. Moreover we had a compass, GPS, food, water and even emergency blankets with us. The day after our bad experience with trying a tailored trip with a hired car, we therefore did the journey again: but this time on our own, by public bus. Not only is it much cheaper, but we were finally able to visit both San Khong Phan and walk the Hintang forest trail along the other sites that day. Colani M., 1935: Mégalithes du Haut- Laos : Hua Pan, Tran Ninh (2 vols.). Publications de l'Ecole Francaise d'Extrême Orient vol. XXV-XXVI. Les editions d'art et d'histoire, Paris. Colani M., 1934: Note sur les Mégalithes du Haut-Laos (Montagnes du Tran-Ninh et des Hua Pan). Bulletin de la Société préhistorique de France, tome 31, N. 7-8. pp. 335-352. While I firmly believe that archaeological heritage should be accessible to the public (where possible), the fact is that archaeological heritage is vulnerable. And this includes megaliths. When visiting the sites featured on this travelblog, behave responsibly. Avoid damage, abide by instructions and do not litter. (c) Dr Marco Langbroek. Simple theme. Powered by Blogger.